Illy Iperespresso "Brasile" capsules compatible with domestic Iperespresso machines (X7.1 - Y1.1 Touch - Y5 - Y3 - X8 - Gaggia Iperespresso). This pure origin coffee from Brazil is characterised by an intense taste with notes of caramel. A unique taste sensation. 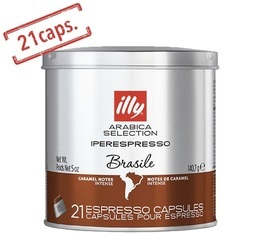 1 box of 21 Illy capsules.